Strip away Tomorrowland’s thematic ambitions and you’re left with an entirely serviceable Disney product: entertaining, easy to consume, and the usual uneasy blend of the heartfelt and the glib. Directed by Brad Bird, who co-wrote the script with Damon Lindelhof and Jeff Jensen, the film is most charismatic in its depiction of the marvelous City of Tomorrow with its streamlined architecture, gleaming spires, levitating trains, daredevil jetpacks, shiny rocket ships, and helpful robots. The film’s retro-futuristic vision purposely draws on the past’s hopes for the future, asking why our present doesn’t live up to the utopian ideals dreamt by a world still reeling from the devastation of World War II and, crucially, its atomic horrors. What went wrong? Insofar as Tomorrowland follows the beats of a conventional adventure movie – with teenaged Casey (Britt Robertson) caught up in a plot to prevent world destruction by solving the mystery of a city glimpsed virtually via a lapel pin – we get our fair share of excitement from the usual moments of peril (and hair-raising escapes), punctuated by the frequent, shamelessly fun indulgence of our fetish for cool gadgets. The most thrilling moment involves the Eiffel tower and a bit of revisionist history. But some of the quieter character moments are impactful too, whether it’s the loving father-daughter interaction between Casey and her NASA engineer dad (played by Tim McGraw) or the moment budding child inventor Frank (Thomas Robinson) presents his jetpack at the World’s Fair in the hopes of proving himself. Also: the never-dull Hugh Laurie as the film’s antagonist, David Nix. Tomorrowland’s appeal is mostly eye candy, but we can at least sympathize with a teenager who resorts to sabotaging cranes in an effort to prevent the demolition of a NASA shuttle launching pad. The film is fundamentally rooted in the wonder of science – a sentiment that is all-too-lacking in an industry that has a greater affinity for magic and fantasy. Yet the film doesn’t mean what it thinks it means. Although presenting itself as a critique of the apocalyptic mindset we’ve apparently adopted, reminding us of the hope and optimism the world once held in regards to the future, Tomorrowland offers instead an unworkable, self-defeating, and corruptible vision. The story’s premise of a secret city in which the world’s best and brightest dreamers can work unencumbered by politics and bureaucracy is troubling in itself. It’s an idea lifted from Ayn Rand’s Atlas Shrugged, reinforced by notions of recruitment via special pins delivered to the worthy few as well as the repeated assertion that Casey, like Frank before her, is “special.” Not only does Tomorrowland set up a literal ivory tower whose relationship to the world is lofty and superior, the film populates said tower with insular elitists where the ordinary and common need not apply. How the work of these elites is supposed to benefit the common people is never explained, which leads to another risible aspect of the film’s vision: the utopia it presents is technological in nature, as if better and more wondrous technology is enough to fix everything. It would be laughable for its naivety if it weren’t an attitude adopted by many of the world’s technologists, like Bill Gates and Elon Musk. In positing a politics-free community, Tomorrowland misses the point: all human interactions are politics to some extent. The question isn’t one of eliminating politics, but of replacing bad politics with better ones. Alas, the social dimensions of the problems we face are swept aside by the awesome sight of technological innovation. Why grapple with the gray chaos of psychology when you can launch your jetpack with the 1 or 0 certainty of engineering? Trying to pass an elitist techno-utopia as a vision to aspire for is enough to sink the film’s preachy claim to optimism. Seeing how Tomorrowland’s idealism lacks conviction exposes how superficial its vision is. The film’s cavalier treatment of violence is one example. As Casey, grouchy adult Frank (George Clooney), and the android child Athena (played with scene-stealing personality by Rafey Cassidy) try to find a way back to Tomorrowland, they are pursued by Stepford Men in Black who unhesitatingly vaporize humans who get in their way. No thought is spared for these victims … nor is any question raised about the violence directed towards the androids. The only difference between the beheadings, stabbings, and beatings in Tomorrowland and those we’d find in a horror movie is the sanitizing effect of mechanical destruction versus flesh-and-blood gore. On a broader level, this casual brutality serves to ironically betray the antagonist’s condemnation of the world’s savagery. If his Tomorrowland represents civilization, why is violence so thoughtlessly deployed? And why does David Nix style himself like a military dictator? It’s disappointing to find a film proclaim imagination and hope as the antidote to apocalyptic despair only to ultimately settle differences of perspective by the brute force that enables apocalyptic movements. When Hugh Laurie’s dour character eloquently describes the motivational problem we have as a species confronting world-alternative challenges, his bleak and accurate outlook is not defeated or counteracted by imagination and superior reasoning, but by explosions and a crushing death. Forget the hopeful message, then: Tomorrowland reduces itself to capacity of the strong to impose their will on the weak, however indirectly, even as it hopes the victors are special, enlightened people. 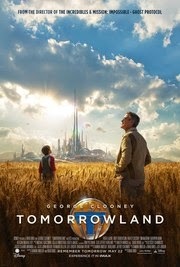 That Tomorrowland is enjoyable at all stems from the strength of many of its parts; the production design, character-building moments, and that flicker of a genuine human hope for a better future. Yet as far as the search for a credible 21st Century update to Gene Rodenberry’s optimism is concerned, these aren’t the droids we’re looking for.